This gorgeous cabinet features two shelves and a pullout drawer to keep your precious possessions orderly, but their fantastic die-cut floral faces make this unique storage cabinet a show-stopping showcase of great design. 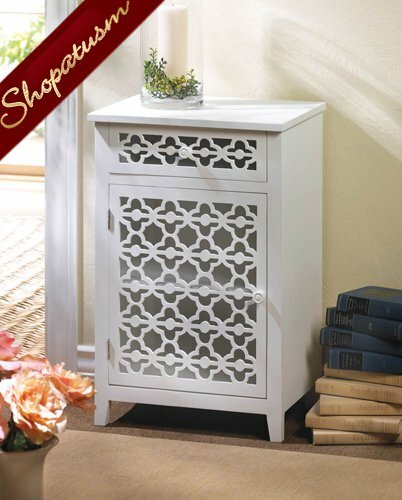 The white-painted wood will brighten your bathroom or make your bedside cheery! Item weight: 20.2 lbs. 19 inch x 13 inch x 29 inch high. Pine and MDF wood.